The game now works with BIG (multiplayer features disabled). 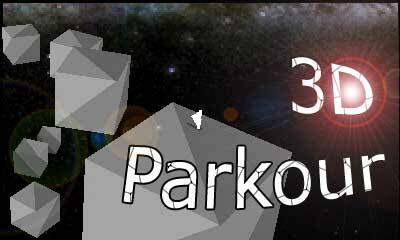 I've included the very first versions of 3D Parkour, as well as the UI before it was implemented into the game. 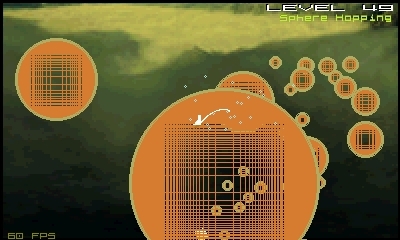 A few new levels have been added to the end. 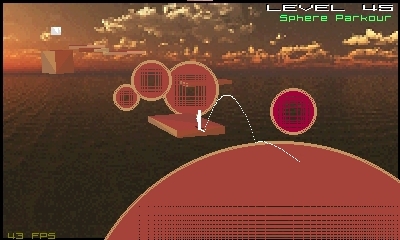 Minor graphical changes, such as starting out in B&W, sky tinting, and submarine sprites. This update just deals with behind the scenes improvements and small tweaks to improve gaming experience. There have been slight level modifications. Level 8 has been replaced and made less frustrating. Changed the way 3D Parkour communicates with other files, behind the scenes. Sky building tool has undergone many improvements and bug fixes, both skies in each file can now be loaded and reused. Everything from this version now works inside Alpha OS X with no errors. 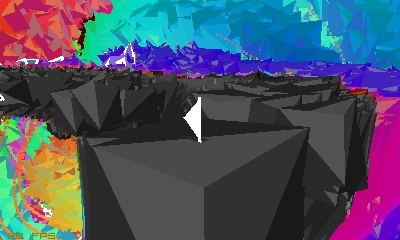 Added an in-game sky building tool (a compatible version of Fractal Canvas). The game now starts up immediately, and loads in all the music for the first few seconds while the user is playing in order to provide a better gaming experience. 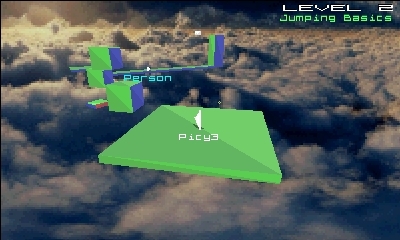 When flying, the player can now fly out of bounds, but cannot dismount unless inside the bounds. 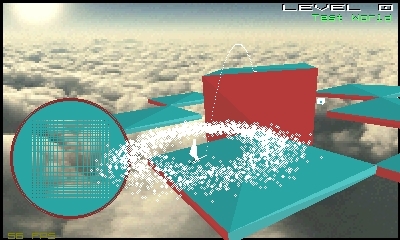 Loading a new level causes a particle explosion. Added option to turn and jump while in the air. Added option to adjust fly and adjust flying speed. Added the option to fly upsidown. Added an option to make the platform the player is on follow the player to ensure the player does not fall off... just try it (the bottom of menu #4). FOV can now go negative. The game still functions normal after deleting the music file and all the SKY graphics pages (this is to save space if necessary). Menu icons have been modified. Game does not lag anymore when scrolling a menu with the stylus, this is a huge improvement. Added levels 60 and 62 and modified other various levels to make use of more features. Fixed many bugs such as changing FOV or camera distance. Added more sound effects such as different noises depending on how hard you hit the ground. Added levels 48, 51, 54, 61. Many other minor tweaks that improve performance and the overall stability of the game. The game should run much smoother on the original 3DS. 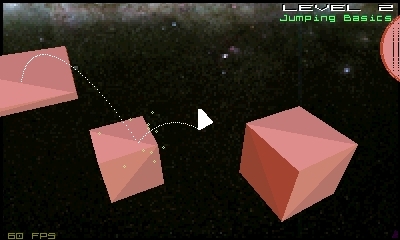 Added a level selection menu containing a level search option as well as much quicker navigation. You can type a substring and it will list every level containing that string and a 3D preview of each result. Elytra givers have customizable velocities by modifying their rotational velocity variable. Flying feels more realistic due to camera and particle effects. Elytra now go double as fast when holding X . Added toggleable speed GUI in menu 3. Units have been globalized, set to meters. Default FOV has been tweaked to match the new unit globalization. Fixed the calculator so that it functions properly. Many other various improvements and modifications, this version has been extremely polished and tested. Added elytra wings for flying. 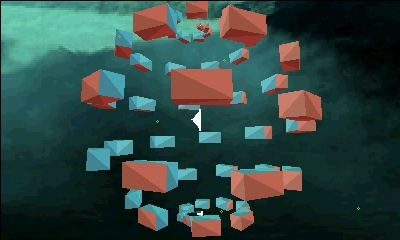 Added world flipper block to rotate the world upside down. Added backward compatibility for older level files so that they are not detected corrupt. Added spheres as well as trampoline spheres. Added particles when the player hits the ground. Added world view distance option to allow larger levels. Added player trail to visualize where the player travels and velocity. Zoom speed has been slightly slowed down. 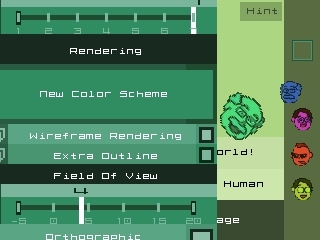 Menu scrolling and rotating the camera while paused has been improved. Added toggleable GUIs in menu 3. The nearly impossible levels have been modified to not rely on luck as heavily. Pressing L will fire a particle bullet (for fun). Cheat codes in the chat are more overpowered ("/L+ /L+ /L+ /L+ " is now equivalent to /L++++). Skyboxes can now be added and deleted by the user without any issues. Simply add or remove a "SKY#" graphics page. Entire game has been translated into Japanese. New menu added (for camera filters). The editor is much easier to use (sliders specifically). A chat bubble appears above a player talking. Level tweaks to make game more enjoyable. Lower screen was redesigned a bit. Many songs added, replacing the previous lower-quality ones. 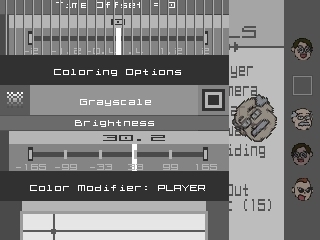 Added brightness and grayscale (at the bottom of menu 2). Exiting the game via Exit button will reset all system settings and extended features that were modified. Flickering stripes glitch has been worked around. Graphics render properly with back-face culling. Menu items were slightly reordered and tweaked. 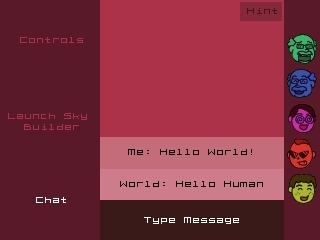 Improved the 2nd control scheme, easier to use. The chat talks back to you. 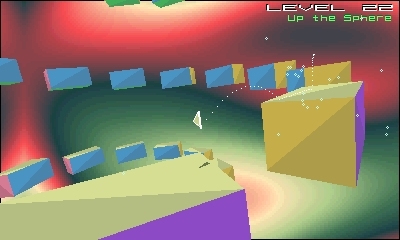 Sandwich level is a tiny bit easier and the graphics upgrade makes it look much better. A few other minor adjustments. Player shadow is always visible when above an object. Finally removed the annoying player rotation animation which was the cause of countless deaths. Platform sliding has been slightly lowered. Minor adjustments to resolve too easy/too difficult levels. Now introducing a new control scheme where the circle pad controls player movement, try it out by going to the orange menu, tell me what you think. Also a slight performance boost. Game finally out of beta. Are you able to remove the antivirus's whitelist for websites (...)? ... It seems like a firmware reset for your 2DS is necessary with all the errors going on. Try uninstalling that antivirus using the Windows Defender until you can get another one. (...). Then see if you can download a NAND dump.